Join the leader in executive coaching certification and training for accomplished professionals. Get proven tools and processes to attract great clients, have enormous impact, and love what you do. The Center for Executing Coaching strengthened my outcomes focus in one-on-one client work. Specifically, Andrew’s curriculum design provided comprehensive content and ongoing community support. I highly recommend joining the Center for Executive Coaching as it has far exceeded my expectations in quality of material, the access to resources and above all the leadership of Andrew Neitlich. If you are looking for a clear, no nonsense approach to executive coaching I strongly recommend Andrew and the Center for Executive Coaching as your only choice for your personal development as a coach. Andrew and the Center for Executive Coaching provide outstanding training! I am so glad I found CEC after looking extensively for the right program to learn how to coach. The Center for Executive Coaching has changed my life! The curriculum is first-rate and the tools provided to his students give them a clear competitive advantage in the field. I give the Center my highest recommendation. The Center for Executive Coaching is the real deal! Founder Andrew Neitlich is an amazing, inspiring executive coach who enables you to look within and connect the dots. I enjoyed the simple, no non-sense coaching approach. I highly recommend you go to the in-person workshop and be prepared to be enlightened and reach the next level. Outstanding! Director Andrew Neitlich is very hands-on throughout the program and more importantly he continues to provide support even after you obtain your certification! The skills you learn and the tools provided are invaluable!! I am excited about what I will be able to accomplish in the future. Thank you!! If asked to rate the Center for Executive Coaching with a Likert scale of 1 through 5, I would give it a 6. By far the best continuing education/ certification program I have ever participated in. I highly recommend his program as the investment-worthy top choice. 100% focused on PRACTICAL, MEASURABLE RESULTS for you and your clients. Our goal is that your clients receive at least a 5-10x return from coaching. Learn more about our advantages! Not sure which program best suits you? 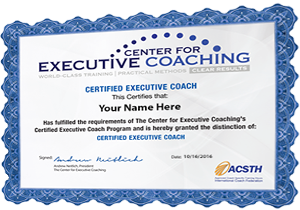 Seasoned coaches don’t need to join our full executive coaching certification program. We have a number of programs for you: The High-Performance Coaching Academy, a turnkey program you can offer to high-potentials in companies; the Exit and Succession CEO Roundtable, for coaches to offer to CEOs of small and mid-sized companies; and the Business Development Intensive for Coaches, which in our opinion is an unmatched approach to attracting clients and building your practice. Organizations come to us to train their internal coaches; provide coaching skills to managers and leaders; and – for consulting firms – to help consultants add coaching to what they already do, whether as a source of new revenue or to improve the probability that clients accept their recommendations. We also provide best-in-class solutions through executive coaching programs. Coach! The Crucial, Deceptively Simple Leadership Skill for Breakaway Performance. Get the newest book from the Center for Executive Coaching and preview the kind of content we offer!